Blog What is the Influence of Capsaicin (CAP) for Swimmers in Sprint Training? 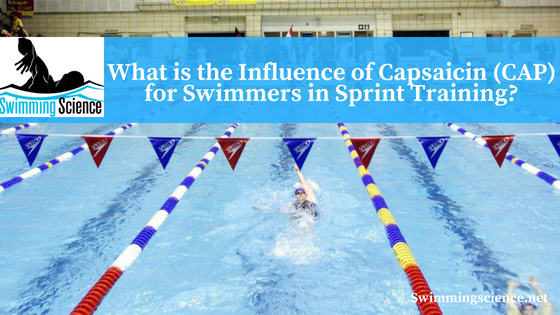 What is the Influence of Capsaicin (CAP) for Swimmers in Sprint Training? The ability to perform repeated sprints with minimal fatigue is important for swimming training and competitions with multiple events with minimal rest. Supplements are an enormous industry, commonly projecting breakthrough supplements to improve performance. IL-6 is a cell signaler (cytokine) with both pro-inflammatory and anti-inflammatory effect, which may be important in the recovery process, but extended elevations may impair recovery. CAP is a major component in hot peppers which give the fruit a distinct flavor and is commonly prescribed for weight loss and aiding digestion. Physiologically, CAP antagonizes transient receptor potential vanilloid receptor type 1 (TRPV1) causing the intercellular influx of cations and resulting analgesia. Activation of the TRPV1 receptor may influence the flux of calcium ions, and influence muscle contraction. The purpose of this study was to determine the influence of capsaicin (CAP) on the performance of and the interleukin-6 (IL-6) response to repeated sprints. Nineteen experienced male athletes participated in a placebo-controlled crossover study. During one trial, they consumed 3 g/day cayenne (25 mg/day CAP) and the other day a placebo for days. Directly following the supplementation, they complete a repeated sprint test (RST) consisting of fifteen 30-m maximal effort sprints on 35-second intervals. Fasted blood draws for IL-6 were taken at baseline before supplementation, 45-minute pre-RST, and immediately post-RST. The rate of perceived exertion (RPE), muscle soreness (MS), and gastrointestinal distress (GD) for 5 symptoms were measured 1-minute pretest, during, post-test, and 1-minute post-test. Muscle soreness was also measured 3 days post-test. CAP significantly increased GD, without a difference between trials in fastest or mean sprint time, fatigue, IL-6 response, RPE, or MS. In short, CAP increases GD without any improvement in performance of anti-inflammatory response. This study does not suggest any benefit from capsaicin supplementation for improvement in performance or volume of anti-inflammatory response for repeated sprints. Opheim MN, Rankin JW. Effect of capsaicin supplementation on repeated sprinting performance. J Strength Cond Res. 2012 Feb;26(2):319-26.